Miko Peled recounts his travels through occupied Palestine. From Tarshiha to Hebron, Peled highlights the stark juxtaposition between the beauty of the land, and the ugliness of its occupation. CCUPIED PALESTINE — The beauty of Palestine in late February and particularly after a few spots of rain is unmatched. Lush green and almond blossoms everywhere, but from Tarshiha near the Lebanese border in the north to Lakia in the Naqab desert in the south, the horrors of a relentless, oppressive regime that shows every sign of becoming more oppressive are everywhere. A jewel in the northern Galilee is lush green and beautiful with signs of prosperity all around. In 1948, Tarshiha, which had a minority Christian population, was subjected to a brutal ethnic cleansing campaign but the Christian families were permitted to return. Today, the full name of the town is Ma’alot-Tarshiha because the neighboring Israeli settlement of Ma’alot, which sits on Tarshiha lands, has taken over and the two now comprise a single – yet segregated – town sharing a single municipality. Still, with all the signs of prosperity, families remember the horrors and many are still living in far off refugee camps, unable to return to their homes and their land. Tarshiha’s son, Palestinian actor Ashraf Barhoum, is now working on a documentary film titled, “Tell me Tarshiha.” In it, he will tell the stories of the survivors of the 1948 Israeli destruction of Palestine, all born in the 1939’s. The movie will document their lives under the British mandate, the Zionist occupation, and their thoughts about the future. Further south, in the “Triangle” area just west of Tulkarm and Nablus, a protest tent is erected at the entrance to the city of Qalansawe. Several home demolition orders have been given to citizens and there is an ongoing protest as well as a legal battle. However, if history has shown us anything, it is that Palestinians rarely, if ever, win legal battles against the state of Israel. It is interesting that while Palestinians — even ones with Israeli citizenship — are subjected by the Israeli authorities to the cruel punishment of having their homes demolished if the state determines that they were built without a proper permit, one never sees the same enforcement take place in Israeli Jewish communities. Israeli Jews too build without permits but if they are caught they face fines and legal and bureaucratic processes that sometimes take years. 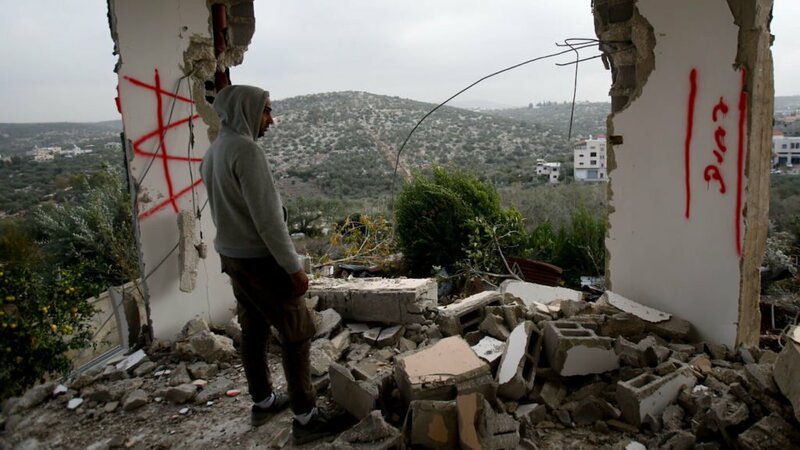 But one never sees the police or the military close down an Israeli street and bring in bulldozers to demolish a home. Traveling even further south, as Palestinians commemorate the 25th anniversary of a terrorist attack that struck at the heart of the old city of Hebron, the prime minister of Israel makes an alliance with the people who celebrated the attack. The terrorist — a Jewish doctor from the extremist, fundamentalist settlement of Kiryat Arba — entered the Ibrahimi Mosque during morning prayers and with his semi-automatic rifle sprayed the worshippers killing over 30 unarmed people. Prime Minister Benjamin Netanyahu’s new political allies view that killer as a hero. The response by the Israeli authorities to the attack was to destroy Palestinian life in the old city of Hebron; close down the main business avenue, Shuhada Street; and turn it into a ghost town. This week, Palestinian grassroots activists embark on the annual Open Shuhada Street campaign, and Netanyahu signs a deal with racist thugs who continue to terrorize innocent civilians. The victims of the February 25, 1994 terrorist attack at the Ibrahimi Mosque in Hebron, Palestine. Also this month, the Israeli government kicked out two organizations that were acting as international observers — volunteers who were patrolling the old city of Hebron, as well as other parts of Palestine, and who monitored the harassment and terrorizing of Palestinian civilians by Israeli settlers and soldiers. However, not ones to become victims, a local Palestinian group, Youth Against Settlements, or YAS, picked up the mantle and initiated its own observer project to watch over the children and protect them from Israeli brutality in the city. All that is left of the Palestinian-Bedouin village of Al-Araqib is the cemetery and a few tents. Sheikh Sayah Al Turi, the leader of the village, is currently in an Israeli prison because he refused to sell his land and insisted on remaining on it. Time after time the Israeli special police unit — called “Yoav” — violently came to destroy the village and push out the residents, and time and after time the residents fought and rebuilt. The beauty of Palestine notwithstanding, the suffering, violence, and oppression by the Zionist state is like a plague, killing everything. The one thing that stands in the way of Israel’s killing and destruction in Palestine is the indomitable spirit of the Palestinian people and the laughter of their children.